I got this dress from my cousin and aunt for Christmas. I have to tell you right away that it's not available on Matalan online so you'll need to check Matalan stores if you live in the UK and like it. I'm wearing a size 28 and it's seriously oversized, which is good news is you're a size 30 or above and manage to find one. The dress is fully lined in the body with a stretch black material, and the arms and the over layer are a floaty chiffon. You can see my tattoos through the sheer arms. 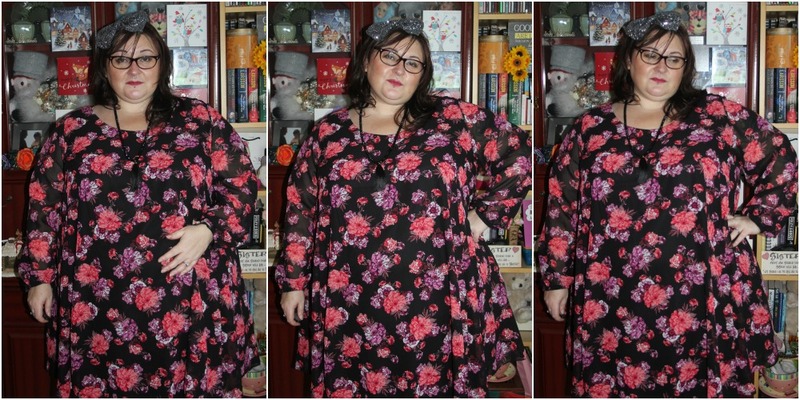 Swing dresses can be a contentious matter in plus size circles as some plus size folk believe that you have to wear tight fitting clothes at all times (flattering clothes) or else you're breaking some hallowed fat girl code. But swing dresses are so comfortable! You don't always have to dress to please other people's eyeballs. Dress for yourself - if you want to wear shapewear and corsets go for it, but if you live in swing dresses or oversized clothes that's cool too. I've worn this dress about 3 times since Christmas, it's my new fave.